The process of giving up gluten can be tough. Think about all of the amazing bread-related foods you were forced to give up in an instant. If you said biscuits then you’re on the right page. When you think about it gluten-free and biscuits dont really go together. To have the same texture and flavor you’d get out of regular biscuits seemed virtually impossible to me. 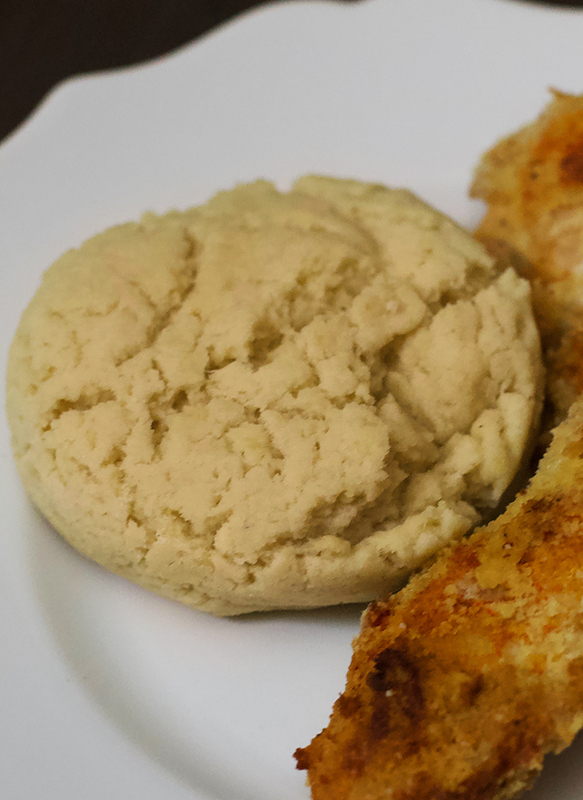 Until I came across this amazing recipe for gluten-free biscuits from Spinach Tiger. 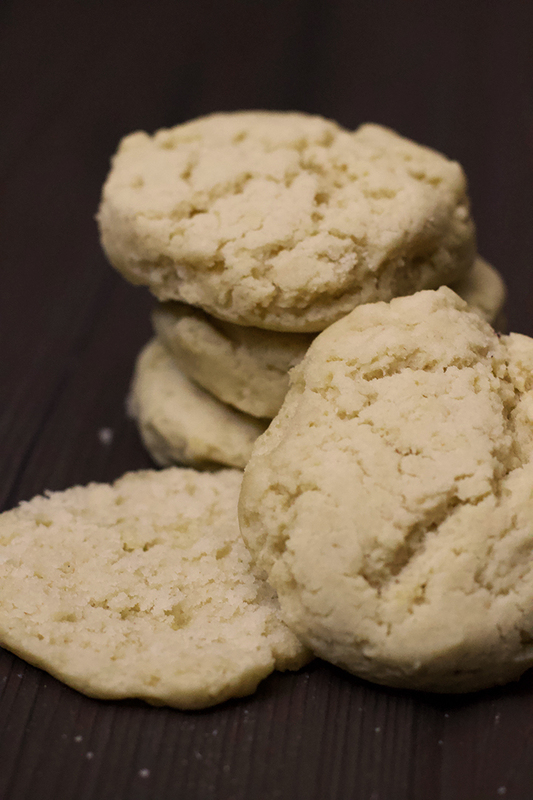 Name who put in so much time, effort and pride into her multiple variations of gluten-free biscuits did all the work on this biscuit recipe. I just modified this recipe so it’s dairy-free as well. These biscuits are fluffy and flavorful. You’ll never look back. If you want to make them so that they taste great with jam or something sweet, then just omit the garlic in the vegan ricotta cheese. Whether savory or sweet, you can’t go wrong with this recipe. I hope you enjoy it! **This recipe was inspired by a recipe on Spinach Tiger [dot] com, created by the wonderful Angela Roberts, who put in so much time and effort into perfecting it. She has over 10 different kinds of biscuits so she’s the real specialist in that department. What I modified below makes this recipe completely vegan. I hope you enjoy! 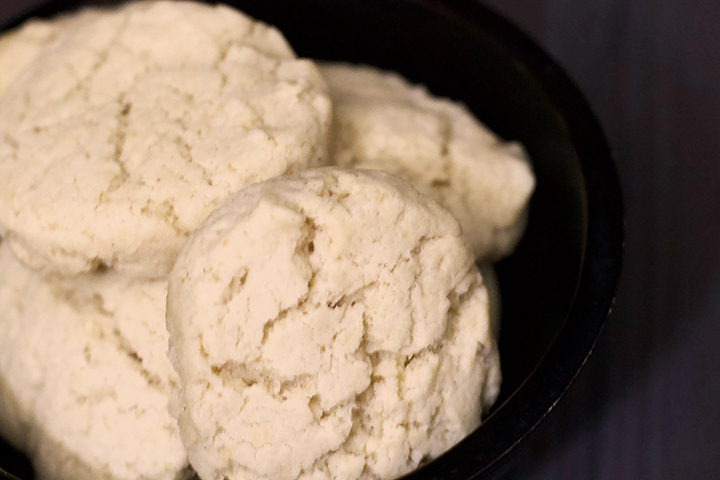 Crispy, buttery, gluten-free biscuits… yes, it’s worth repeating a second time. These biscuits will make you so happy. If you haven’t had a good tasting biscuit in a while, this one is SURE to please! Soak 1/4 cup of cashews in water, just enough to cover them. Soak for 30 minutes. Measure out the vegan butter and put on parchment paper or a paper plate. Cut butter into small (1/4 inch pieces). No need to measure 🙂 Put in the freezer for 15 minutes. Mix flour, baking powder, sea salt, and sugar together in a bowl. Once 15 minutes have passed, remove butter from freezer and put into the dry mix bowl. Mix butter with your hands until the mix has become clumpy. Add in egg replacement and “ricotta cheese”. Mix with hands. Slowly add “buttermilk” and mix up each time you do. You’re going to want to have a sticky mix. You may not use all your buttermilk. It all depends on the brand of flour, as well as whether or not you weighed your flour (I didn’t, which is probably why I didn’t use all my buttermilk). Once it’s sticky, I mean “really difficult to remove the mix from your hands” sticky, you’ll need to wash your hands. Either on your counter top or on a large cutting board, sprinkle some flour and flip that bowl upside down to release all of the mix onto the surface. DO NOT MASSAGE MIX. You simply need to create a 2″ high circle out of the mix and cut it into circles using a deep biscuit cutter. You should get about 7-8 biscuits, but you might get more if you measure your flour. As you cut them, align them on a cookie sheet so that they “kiss” – not touch completely. Bake for 15 minutes at 350 and voila! You’ll have nice fluffy biscuits in no time! Just let them sit for about 5 minutes before eating to prevent them from completely falling apart mid-bite. For more information on measuring your gluten free flour, please refer to this article by Food52. 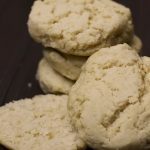 [wpurp-searchable-recipe]Crispy, Buttery, Gluten-free Biscuits – Crispy, buttery, gluten-free biscuits… yes, it's worth repeating a second time. These biscuits will make you so happy. If you haven't had a good tasting biscuit in a while, this one is SURE to please! – vegan butter, gluten free flour (I used King Arthur Flour), gluten free baking powder, sea salt, organic coconut palm sugar (omit if making it yeast free), egg replacement (Bob Mills) (or use an organic egg if not vegan), "Ricotta" Cashew Cheese (Blend these ingredients until smooth): cashews (soaked in water for 30 minutes to 2 hours), lemon, garlic, almond milk, cashew water (what was left in bowl after soaking), Vegan Buttermilk : apple cider vinegar (put this into a measuring cup first), almond milk (top off measuring cup to equal 1 cup total), , Soak 1/4 cup of cashews in water, just enough to cover them. Soak for 30 minutes. Measure out the vegan butter and put on parchment paper or a paper plate. Cut butter into small (1/4 inch pieces). No need to measure 🙂 Put in the freezer for 15 minutes. ; Mix flour, baking powder, sea salt, and sugar together in a bowl. ; Once 15 minutes have passed, remove butter from freezer and put into the dry mix bowl. Mix butter with your hands until the mix has become clumpy. ; Add in egg replacement and "ricotta cheese". Mix with hands. ; Slowly add "buttermilk" and mix up each time you do. You're going to want to have a sticky mix. You may not use all your buttermilk. It all depends on the brand of flour, as well as whether or not you weighed your flour (I didn't, which is probably why I didn't use all my buttermilk). ; Once it's sticky, I mean "really difficult to remove the mix from your hands" sticky, you'll need to wash your hands. Either on your counter top or on a large cutting board, sprinkle some flour and flip that bowl upside down to release all of the mix onto the surface. ; DO NOT MASSAGE MIX. You simply need to create a 2" high circle out of the mix and cut it into circles using a deep biscuit cutter. ; You should get about 7-8 biscuits, but you might get more if you measure your flour. ; As you cut them, align them on a cookie sheet so that they "kiss" – not touch completely. ; Bake for 15 minutes at 350 and voila! You'll have nice fluffy biscuits in no time! Just let them sit for about 5 minutes before eating to prevent them from completely falling apart mid-bite. ; ; – Use organic ingredients whenever possible.